We recently had a significant sale on several of our home study products, including materials for total beginners through advanced intermediates. I'm grateful to all those who made purchases, and I want to return the favor by offering a follow-up conference call, featuring your questions on one end, and my answers on the other. Before I go much further with the details, I'd like to get a sense of how much enthusiasm is out there for such an event. You can help by expressing your opinion on this blog page below. Here is my plan so far. 1. It will be a conference style telephone call, using plain old telephone service (POTS) so as not to confuse anyone (especially me) with advanced Internet technologies. 2. We will set up some way to accept questions, whether through live dialog on the call or by having them pre-submitted. 3. The call will be open to everyone on our newsletter subscription list, whether they have purchased anything or not. 4. It will be open to guests who are not on our subscription list too. So if you are a member of a piano interest group (online or otherwise) I encourage you to share the information with anyone who might be interested. 5. The call will be scheduled at a time that would hopefully be convenient to everyone in all three of our time zones (seven if you include Alaska, Hawaii, and the Maritimes). 6. It will be 100% free to participate, either as a direct participant or as an observer. The only thing you pay for is the long distance call if you are on such a calling plan. Most people aren't, so it will be 100% free for them. Sound like a plan? Then please let me know what you think. Really, I won't go to the trouble to put this together unless I can anticipate real participation. So please, don't hold back your thoughts. If you have prior history with us, either from buying our home study products, or from taking workshops or retreats, I especially want to hear from you. It seems I make this announcement every year, but I think it's really worthwhile. Bear in mind that the music of New Orleans holds a special place in my heart, and that New Orleans PIANO music is the best there is. Which brings me to the subject of "Piano Night" in New Orleans. This is an annual event which brings together most of the top New Orleans style piano players in the world. Perhaps the best known living New Orleans pianist remains Dr. John (Mac Rebennac). But there are many others. This year's lineup features Ellis Marsalis (Wynton's father), Jon Cleary, Davell Crawford, John Gros, and Marcia Ball. This event is held in conjunction with the annual New Orleans Jazz and Heritage Festival. 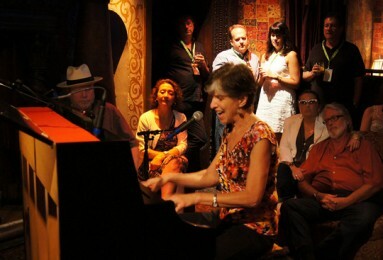 This year piano night will be held at the New Orleans House of Blues on Monday, April 28. Things usually start around 7 pm local time (or 8 on the east coast and 5 on the west coast). Ticket prices start at $87 and go as high as $314. But even if you won't be in New Orleans to catch this show, you can hear it for free by tuning in to WWOZ.org on the web. The radio station broadcasts Piano Night every year. And they play New Orleans music every day 24/7. If you like it and use it, send them a donation. Now if you want to hear a sample of the New Orleans style of rhythm and blues, here's a clip of a band that I'm in, playing the music I love. That's me on piano, of course. If you view this on YouTube, I'd appreciate getting a comment. I try to make this announcement every year, and it's hard to believe that another year has gone by. Swooosh. Of interest to music lovers the world over is what is arguably the most ambitious music festival of all, the New Orleans Jazz and Heritage Festival. Although their music offerings tend to skew toward the fertile sounds that have been bred in the Crescent City, the festival puts on display a wide variety of music from the world over. As a New Orleans style piano player, my favorite part is the annual Piano Night, which this year will be on this coming Monday, April 29, live from New Orleans' French Quarter. It's been awhile since I've attended one of these in person, but the beautiful thing is you can listen to all of Piano Night from the comfort of your living room, or anywhere you can bring your computer or smart phone and a WiFi connection. Catch the entire event streamed live on radio station WWOZ-FM. Things get under way about 7 pm Central time, so add or subtract the appropriate number of hours for your time zone and check it out. If you like what you hear, let me know. This style of piano playing is kind of a specialty of mine, and if I get enough requests, I may include a workshop of this style at the upcoming Piano Retreat in September.